EPBOT: Sweet Staypuft! 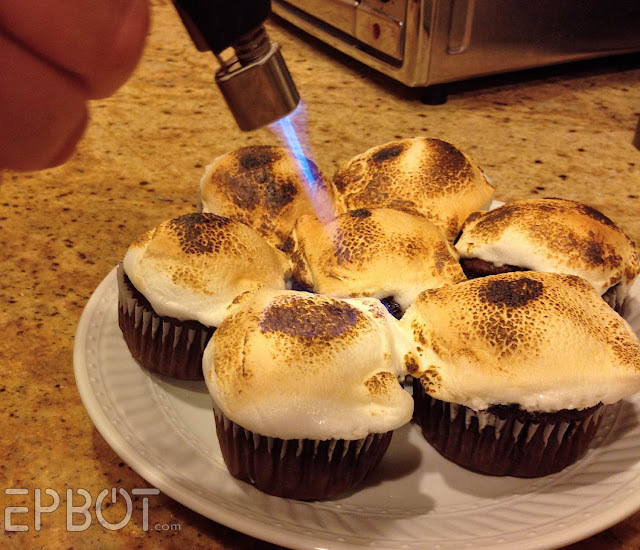 I Tried That Marshmallow Icing "Hack"
Sweet Staypuft! I Tried That Marshmallow Icing "Hack"
So I needed cupcakes around 11PM the other night, for reasons. (Ask NOT why a woman needeth cupcakes at 11PM. Eth.) And not crappy store-bought cupcakes, either: I wanted ooey-gooey, fresh-from-the-oven ones. No problem, except I don't like canned icing, and I was too lazy to make any from scratch. 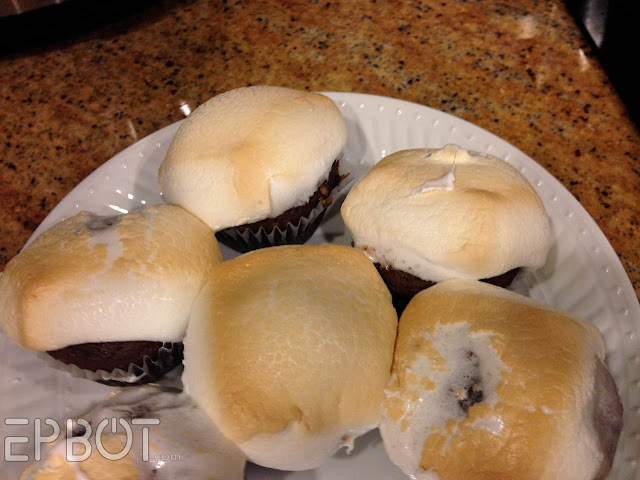 Then I remembered one of those cooking "hacks" on Pinterest, which claims you can stick a marshmallow on your cupcakes for the last few minutes of baking, and BAM. Instant icing. John was his usual trooper and made a late-night marshmallow run. He brought back the Smores ones, figuring the flattened squares would work better. The trick is to get a fork underneath & lift them straight up, so the 'mallow topping doesn't pull to the side. Aw yeah - the more burned, the better. But here's the biggest surprise: the cupcakes were fine that night, but they were phenomenal the next morning. (Yes, I had cupcakes for breakfast. WHAT.) The marshmallow icing just didn't work while the cupcakes were still warm; the taste was underwhelming and the gooeyness was out of control, ending up in a big sticky mess when we tried to eat them. Initially I was ready to write this off, but now? Yes, please. Now, who's ready for cupcakes?? This made me soooooo hungry right now! Showing chocolate cupcakes to this pregnant lady is most dangerous! 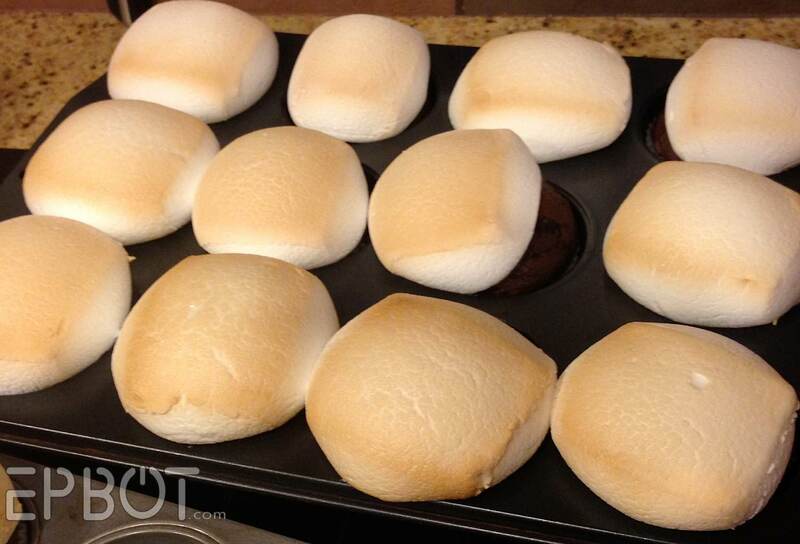 I bet you can just soak the marshmallow stuff off the pan. Muria's right: I was amazed, but it all soaked right off, no scrubbing! I guess since it's just sugar without any gluey flour in it? I have made homemade marshmallows once or twice and was completely horrified by the mess the first time...there was marshmallow stuck all over my kitchen, and me. But it's all water soluble...there's no oil or anything, so it just melts away in water. I was so happy cause after I piped out a million little marshmallows, my back was too sore for a monster clean up! I'll keep that in mind next time I make cupcakes. Last time I used a chocolate cake mix, I was vastly disappointed, but then, I followed the directions. Well, except for the cherry pie filling that I plopped in the middle. The cherry part was great, but the cake was underwhelming (no, I can't remember what brand it was). So you can take a yellow cake mix, add chocolate pudding and chocolate chips, and get chocolate cake? Or is this a hack for chocolate cake mixes? The chocolate pudding is definitely only for chocolate mixes, BUT, I use corresponding pudding in all my box mixes. So just use vanilla pudding for yellow mix, strawberry for strawberry, etc. There's an incredible product called "sweet buttery emulsion. I use it in all my dessert baking to give it that "I'm not a pro but I bake like one" flavour. It kicks up the intensity of anything I'm making. adding chocolate pudding and adding chips is genius. pure genius!! While those look DELICIOUS, I remember you talking about looking for foods to help you with your thyroid/anxiety. Have you tried cutting out sugar? Psychology Today has an article about how sugar can affect mental health; they state that sugar can't cause anxiety, but it can create symptoms that mimic a panic attack. Not to be a downer or anything, but just a thought. Also: Try cook and serve pudding as a slightly-healthier sub for hot fudge. Cook it till it gets thick, and pour it right over vanilla ice cream. SO GOOD. I tried cutting sugar when I first started having panic attacks, since I was desperate enough to stick with it. (Fun fact: this was when I took all my cake decorating classes, so I could never eat ANYTHING I made. Talk about torture!) It didn't help, so after 6 weeks I happily went back to my sweet ways. That said, I know sugar is bad, and I've been hypoglycemic since my teens, so I know how low blood sugar can mimic some anxiety symptoms. On the plus side, since I've dealt with it so long I can usually tell the difference, and at least low blood sugar is an easy fix. I've also learned to eat desserts after a meal or with protein, which helps prevent a crash. I tried that marshmallow hack once and it was just horrible, they collapsed onto themsselves and the cake parts was kinda slimy. I'd be curious to see if that worked! The torch is too high heat to cause them to puff up, so the marshmallow would probably stay the same size - but for the square Smores ones, that'd be just fine! OK, so totally OT, but YAY for how often you've posted this week! Epbot is my *favorite* blog (yep, even passed CW), so I love reading your posts! :) Thanks! Aw, you noticed! Yep, trying to step it up a little with Epbot - this post was actually just a bonus, since I find the more I post, the more I *want* to post. Up to a point, anyway. Just got Lily's results back this week, and she's good! A little hyPO-thyroid now, which is to be expected, and she's gained a whole pound - but STILL hasn't healed all the way on that spot! Arg! I want that to be gone before I update, so I can officially say she's All Good. Marshmallow fluff also comes in a jar . . . I think it's spreadable. I use powdered sugar, cocoa powder, and a little milk to make a great frosting. I always add a box of pudding mix, an extra egg, and a shot of pure vanilla extract. Makes a box mix cake taste so much better. When we ate our wedding cake top tier on our first anniversary, it tasted like it was fresh-baked. (I got those tips from the Cake Mix Doctor. I love her books!) Fresh buttercream frosting is the easiest thing in the world, too. Butter, powdered sugar, some sour cream to cut the sweetness, and pure vanilla extract. Easy-peasy! Hee, I learned mine from the Cake Mix Doctor, too! Love those books. If you substitute coconut oil for vegetable oil in the cake mix it makes the cupcakes super moist and delicious too! Delicious looking idea that I'll have to try. But I'm curious about the instant pudding mix that you put in the cupcakes. Have you found a brand without any dairy products? I'm also lactose intolerant and I either have to make pudding from scratch or use the cook & serve version with almond milk. Also wondering how it's going with the sleep apnea machine. I was just diagnosed myself (40 events per hour - how was I functioning?) after 18 years of thinking it was chronic fatigue syndrome. I'm struggling with finding the right size mask and one that won't make my skin break out. I'm hoping you're having some success with it and I sure sympathize with anyone who can't tolerate it. I also wish I had good news on the APAP front, but I'm still really struggling. After 6 weeks my provider FINALLY got me the humidifier to go with it, which is supposed to help with dryness, but now I feel like I'm breathing hot swamp air, which is a new kind of discomfort. I have about 3 more weeks to get my numbers up to at least 4 hours a night, or the insurance company will take it away - and at this point, that may be a mercy. :/ I hope your process goes much better! Jen, as a fellow Florida girl, I recommend filling the tank with cool water right before you go to sleep (add an ice cube if it floats your boat) and DON'T TURN ON THE HEAT. Just leave the air running across the cool water. Made it amazingly easy for me to use. Also, a fan in the face helps, as it makes the air rushing onto the part of your face covered by the mask and the part not covered by the mask feel the same, so it helps with claustrophobia. Good luck! I agree, Rebecca! While I've never tried the ice cube, I fill my tank and don't turn the humidifier on. Just having the water in the tank as the air passes over it is enough to keep me from drying out. When I turn the humidifier/heat on, it's just too much, even on level 1. Nothing touching your face, although you do end up looking like Davey Jones from Pirates of the Caribbean. Anyway, I LOVE mine, much more than any other mask I've used. You can also sub in applesauce 1 to 1 for the oil (I use those little lunch size cups--1 little cup for 1/4-1/3 cup oil) and egg substitute, for a lower fat, lower cholesterol version with no difference in taste or texture. And if you bake for drinkers, you can sub alcohol for the water. 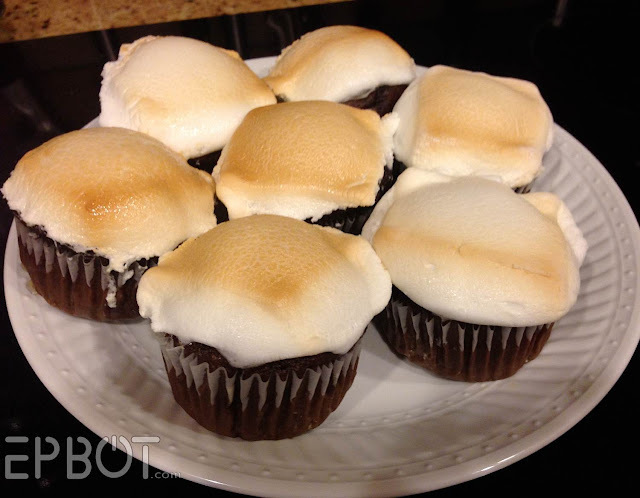 Guinness in a chocolate mix makes for moist, airy cupcakes! I've made marshmallow fondant for a cake or two, and it's totally delicious. So this doesn't surprise me in the least. 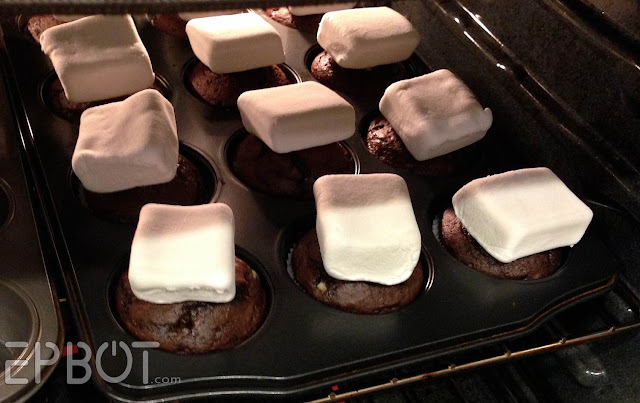 It looks like you could let the cupcakes cook completely, immediately dump the hot cakes onto a sheet pan, top with the marshmallow and stick them under the broiler until the marshmallow is puffed. Or better yet, stick them back into the hot TURNED OFF oven, then after everyone is puffed, turn on the broiler for a few moments or hit them with the mini butane torch. Me! Me! I'm ready for some! I know you live in Florida. BUT. The secret to making great hot chocolate (aside from making it from scratch, which I also have a good recipe for) is the marshmallows. Plop them in the mug and then torch them just like John did. And now I might need hot chocolate. In the middle of July. ME! My "Breakfast of Champions" is the day after Thanksgiving. Hot chocolate with whipped cream (canned, please) and pumpkin pie with whipped cream. But this muffin hack could topple mine. You, genius, you! Ok, if Cakewrecks stands behind this hack this marshmallowaholic will gladly give it a go! Otherwise I think i'll just stick to my cheesecake frosting. Oh, that's right, blueberry cupcakes with cheesecake frosting. I think I'll try this! But I'm going to add a piece of graham cracker to each one under the marshmallow! 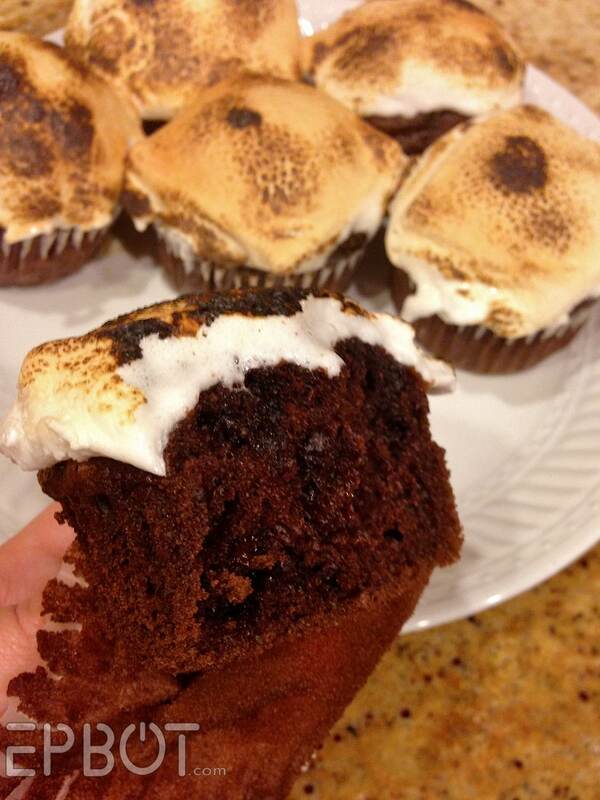 Cupcake s'mores? Just sprinkle crumbled graham cracker on top! Oh, try adding some cream cheese too. Very yum. your post inspired me to run out and get the fixins for some of these for my gang. I used devils food cake mix, cold coffee instead of water, pudding mix, chocolate chips, and a splash of vanilla. The resulting batter was too much for a 12 cupcake pan, but only a wee bit, so I overfilled the cups and ended up with almost ridiculously cartoony decadent cupcakes. 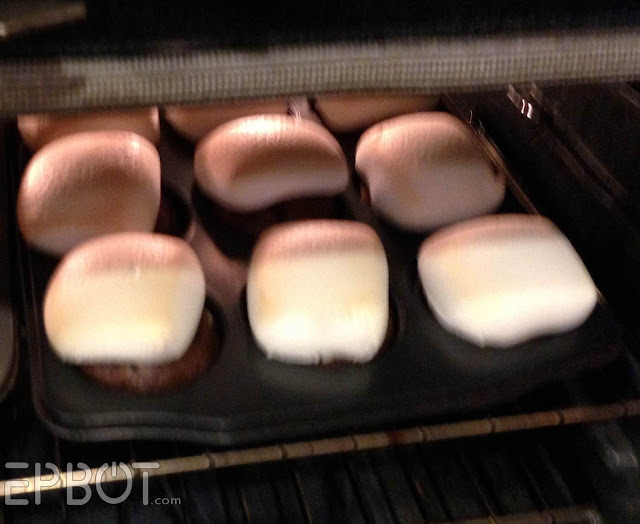 I threw flat marshmallows on top and broiled them a few minutes when they'd finished baking, and then ushered them off to an undisclosed underground bunker so the kids and my fiance wouldn't pick at them until morning. Thank you for mentioning how great they are after sitting - I don't know that I would have thought to serve them cold, and we would have been missing so much! You rock, your community is one of my favorite online people watching spots! This just makes me so happy. I love this blog. I've been here since day one. Thing is I have to stay away from flour and sugar for a bit. But I really enjoyed your delicious experiment.